Clavia (aka Nord) are based in Stockholm, Sweden, and they've carved out a niche in the keyboard market by offering performance‑oriented instruments that probably appeal most to gigging players. You'll search in vain in their product range for a jack‑of‑all‑trades, menu‑driven, multitimbral behemoth. Instead you'll find a handful of models which sometimes overlap in terms of the sounds they offer, but whose different keyboard sizes and actions make each of them quite specialist. That's certainly true of the subject of this review, the Nord Piano 88 (to give it its full title). The NP88, as I'll call it, draws on the same sampled piano sound library that Electro 3 and Stage EX owners have enjoyed for a while, but has some unique features and capabilities. To kick off, let's have some specs. The NP88 has 88 velocity-sensitive keys and uses a Fatar keybed, modified to Nord's specifications with a slightly deeper trigger point than on the Stage EX. This apparently improves fast repetition behaviour and gives a better feel for the acoustic sounds. Key tops are untextured, and there's no 'escapement' resistance during the downstroke. The keyboard action is, I would say, just on the weighty side of average, but still fast and smooth. Three lighter velocity curves can be selected via a front-panel button, but no heavier or fixed ones. Overall length is 1284mm, depth is a compact 340mm and height is 121mm, while the weight is a manageable 18Kg. Construction is of sturdy metal panelling with real wooden end‑cheeks — if you're lucky these might have a really nice grain 'flame' — and all units are hand‑assembled. Standard accessories include a two‑pin IEC C7‑type power lead, a DVD‑ROM containing the Nord Piano Library v5 (of which more in a minute), and a dedicated pedal unit. This offers standard damper, sostenuto and una corda pedals, and connects to a quarter‑inch jack socket on the NP88 via a single captive lead. 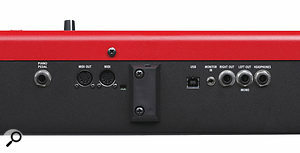 Other rear‑panel action involves a power button with a raised surround that might help to avoid inadvertent power‑offs, receptacles for mounting the optional music stand, and five‑pin DIN MIDI In and Out sockets. A USB socket allows connection to a Mac or PC for MIDI‑over‑USB, firmware updates, and sound/patch management. Audio connections consist simply of unbalanced stereo outputs on quarter‑inch jack sockets, a quarter‑inch headphone output, and a mini‑jack monitor input. Any signal fed in to the last, whether from an iPod or from another source, is mixed with the headphone output, so it has uses as a 'play‑along' feature at home or for handling monitor feeds or click tracks on stage. There's no gain or level control for this, though. I'll make two last observations before we get on to more interesting matters. The NP88 can use the same Keyboard Stand EX as some other Nord keyboards, and this provides exceptionally stable support at two different heights — 75 or 65cm — as well as a nice retro look. Finally, bear in mind that there's no pitch-bend or mod wheel, nor provision for any other kind of real‑time control, such as an input for a MIDI volume pedal, for example. There are basic MIDI control capabilities, but this is not a 'master' keyboard first and foremost. 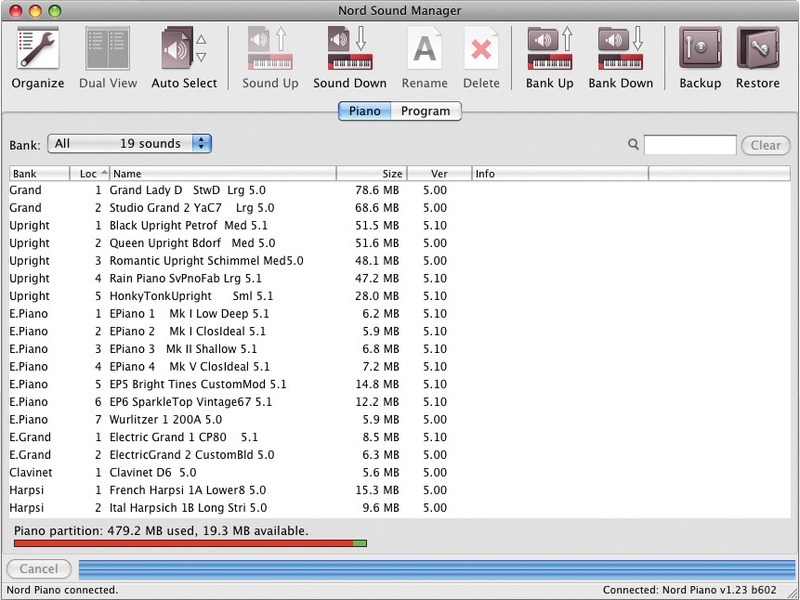 The Nord Sound Manager allows new and alternative pianos from the Nord Piano Library v5 to be downloaded to the NP88 via USB, as well as offering program management and backup/restore operations. A 50MB piano takes about two minutes to be transferred. The NP88 deals purely in acoustic and electric pianos, along with closely related keyboard instruments such as Clavinet and harpsichord. 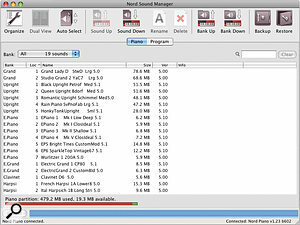 While new units ship with a wide range of sounds pre‑installed, any can be deleted and replaced with others from the Nord Piano Library — currently 1.8GB and growing. See the box below for a run‑down of the factory sound set. Sounds are called up via the control panel in various ways. The first is via the Piano Select buttons: one button chooses the type (grand, upright, and so on), another the model, then the associated LEDs and the 2x16‑character back-lit LCD confirms your selection. There are also 120 user‑replaceable Programs that load a piano type and associated settings such as effects, EQ and transposition. You move through 24 Program banks with the up/down buttons next to the LCD, and then use one of the five numbered buttons below to load individual Programs. Recall is, by the way, instantaneous — no waiting for sounds to load. Finally there's Live Mode. Enable this with the dedicated button and an independent set of five Programs is accessible from the Program buttons. Then any tweaks you make to these are stored instantly. As is the Nord way, nearly all operations are completed with simple dedicated controls. But some less frequently‑needed settings are hidden in a straightforward menu system accessed via the Shift key and the Program buttons. Lurking here are global parameters for fine tuning and transposition, MIDI send and receive channel and local control, and tweaks for pedal noise and sympathetic resonance volume adjustment. A single pedal parameter lets you use a conventional switch‑type damper pedal instead of the supplied Nord unit — thoughtful. It's very much a case of 'what you see is what you get' with the NP88's onboard effects. All the options are presented on five small panel sections, which can be individually enabled, each having a smattering of knobs, buttons and displays. All are evidently designed to be very tactile and immediate, and there's not a submenu in sight. However, knob values are momentarily displayed in the LCD as you adjust them, so it's easy to be precise when necessary. Effects 1 and 2 cover tremolo, autopan, autowah, phasing, flanging and chorus. For each, a selector button steps through different effect intensities, while a single knob controls rate (or, when wah is selected, effect threshold). All sound very good, and there's a decent range of treatments on offer. For example, Autopan can be narrow (Pan 1), wide (Pan 2) or hard and wide (Pan 1 and 2 combined). The modulation treatments are nicely varied, adding a credible 'analogue' thickness and complexity. The EQ is a three‑band design with a swept mid. It does the job, though the perceived effect of some cuts and boost is a little less pronounced than what you might expect from the claimed +/‑ 15dB range. On the other hand, the Amp/Comp section can wreak sonic havoc. Amp emulations offered are 'Twin', 'JC' and 'Small' or you can choose a compressor. A single knob controls drive or compression amount. There's distortion character available here from subtle dirt to snarling edge, and the compressor does a great job of evening things out in a natural way. The NP88's reverb offers two rooms, two stages, and two halls. Each has a suitably different decay time, and they also appear to utilise different algorithms — all the '1' variants are quite natural‑sounding, while the '2' versions are more hyped in the treble and potentially quite ringing. The single knob adjusts wet/dry balance, but despite the simplicity it's perfectly possible to tease a range of good sounds from this simple processor. 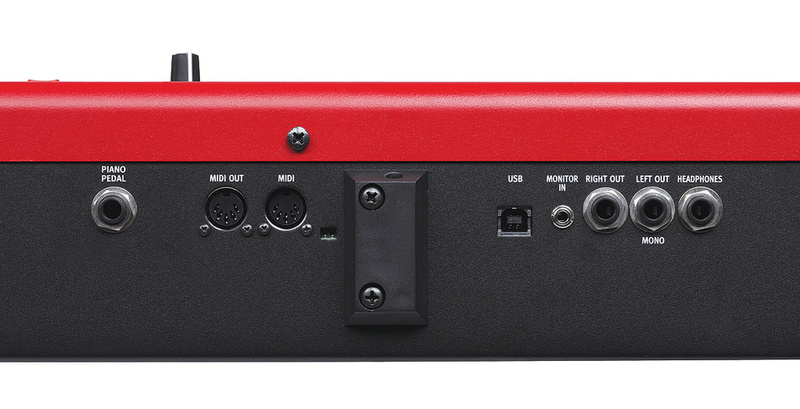 On the rear panel of the Nord Piano 88 can be found a socket for the included footpedal, MIDI I/O ports, a USB connection, a mini‑jack monitor input, and stereo outputs and a headphone port on quarter‑inch jacks. I won't beat around the bush: I think the Nord Piano is fantastic. In a world of computer‑based, multi‑gigabyte piano libraries that eat up even the latest multi‑core CPUs, the NP88 demonstrates what can be achieved with sample sets that are a mere fraction of that size. Forensic‑style investigation of some of the instruments in the Nord Piano Library will indeed reveal subtle changes in tonality between the keygroups and velocity layers the sound designers have employed, but in any normal performance situation this is of vanishing significance and can't be noticed. On the contrary, I was repeatedly struck by just how natural and three‑dimensional the sounds are. The way they respond to changes in touch is wonderfully progressive, and decay tails are rich and complex, with virtually no perceptible looping or 'ringing', even after many seconds have elapsed. The sympathetic resonance feature contributes a great deal, and compared to the rather shimmery, artificial-sounding implementation you'll find on some Japanese stage pianos, this is in a different league. Looking at the individual sounds, the grand pianos are all very fine. The Steinway D is articulate and classy, with a whopping dynamic range and an ability to cut the mustard in classical repertoire. I liked the balanced and purposeful Yamaha C7 just as much, though. Up against these beauties, you might think the upright pianos would look like poor relations. Not a bit of it. These more humble instruments ooze character, and they're arguably miles more useful than the grands for many pop and rock styles. There are flaws aplenty: for example, individual notes having slightly out of tune unisons, and sometimes terrible (though entirely accurate) inharmonicity in the far bass and treble. But this makes them all the more likeable. Riffs and licks just seem to flow out of them. As for the electric pianos, the NP88's are exceptional. They tend to be on the brighter and clearer side than some other keyboards and sample libraries, so while all have warmth and weight at lower dynamic levels, they readily spring into life for soloing. The MkI Rhodes is particularly flexible — bell‑like when played gently, biting when you lay in, and with an apparently completely smooth transition in between. None of the sounds have any release 'tinkle', incidentally, and all take the onboard effects and amp emulation very well. As you can see, simplicity is definitely the order of the day when it comes to the front-panel controls — just what you need in a stage piano.Coming to the Electric Grands, the CP80 is fun and uncannily accurate, while the Gerbstadt grand with CP80 pickups is an unexpected but equally usable sound. The Clavinet isn't as spiky or confrontational as some you'll hear, but again it's a faithful portrayal of the real thing, and a touch of EQ and amp emulation can make it much more angry. As a harpsichordist myself, I can say the NP88's harpsichords are at least as good as most sampled attempts, with a believable resonance and key‑release clatter. They're not quite like the real thing, but they'll be just perfect for mock‑gothic pop, and fine for casual accompanying duties, too. In the interests of balance, I tried to find something about the NP88 I didn't like, but had little luck. There are only two things I can put my finger on. Firstly, it'd be great if there was more memory capacity, though the 500MB or so is not shabby at all. Secondly, the Mono Output feature seems a little odd. It condenses the stereo image of acoustic pianos, so it has its uses for when you're bound to send a single channel feed to a PA, for example. But effects still operate in stereo, so it wouldn't prevent the odd unexpected result, especially with Programs that use Autopan. But that, as I say, is about it. It's going to sound like an awful cliché, but I liked the NP88 so much I bought the review model. It sounds fabulous and feels like a real musical instrument, something with vibe and character that you can build a relationship with. 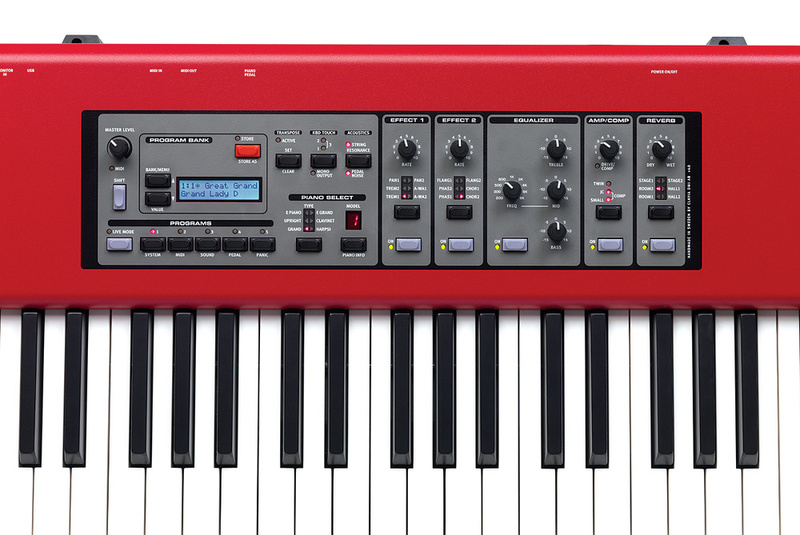 Having the Nord around in the studio, it's hard to imagine needing a computer‑based piano library or modelling application, especially as the great keyboard and pedal action adds so much to the overall package. For stage use, it looks great, it's reliable and unfussy, and it's easy to lug about. What's not to like? As a fairly specialist, piano‑oriented instrument with a full-size, weighted keyboard, alternatives to the NP88 are relatively few. 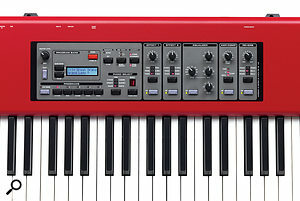 Another £700$900 buys the Nord Stage EX88, which adds organs and synths but loses the pedal‑related subtleties. The Korg SV1 88 majors on vintage vibe, but trades breadth of acoustic and electric piano choice for preset organ, string and synth sounds. Perhaps the nearest competitor is Yamaha's new CP5, but despite its modelling‑based sound production, it has a hard time matching the NP88 for flexibility in piano choice, or sense of realism. 2 x Steinway 'D's (natural and ambient perspectives). 2 x Rhodes MkI (1975/78). Rhodes 1975 MkI Custom Mod (hard hammers). Hohner D6 (in CA, CB, DA, DB rocker-switch combos). Alternative Steinway D and Yamaha C7. Baumgardt upright 'tack' piano (conventional hammers replaced by nails). Gerbstadt acoustic grand with CP80 pickups. One of the reasons why real acoustic pianos generally sound richer and more complex than their sampled counterparts is sympathetic resonance: the subtle vibration of any undamped strings when another note is played. The NP88 implements this (which Nord call String Resonance) by analysing what combinations of notes are in use, and then playing back dedicated resonance samples that are part of a piano's sample set. So, for example, if you hold down a low 'C' silently, then strike a higher 'C' chord, the NP88 generates resonance samples for the coinciding harmonics. The effect is subtle, even subconscious, but this is no gimmick — it contributes hugely to the playing experience and sense of realism. What's really impressive is the scope of the NP88's capabilities in this area: as well as momentary interactions between individual notes, it's also completely responsible for the rich, immersive 'pedal down' sound. If there's a down side, it's that piano sounds that include sympathetic resonance take up more memory. For example, the flagship Grand Lady D piano weighs in at 39.2MB with no resonance samples (in which case, the feature is disabled), and 78.6MB with the full complement. 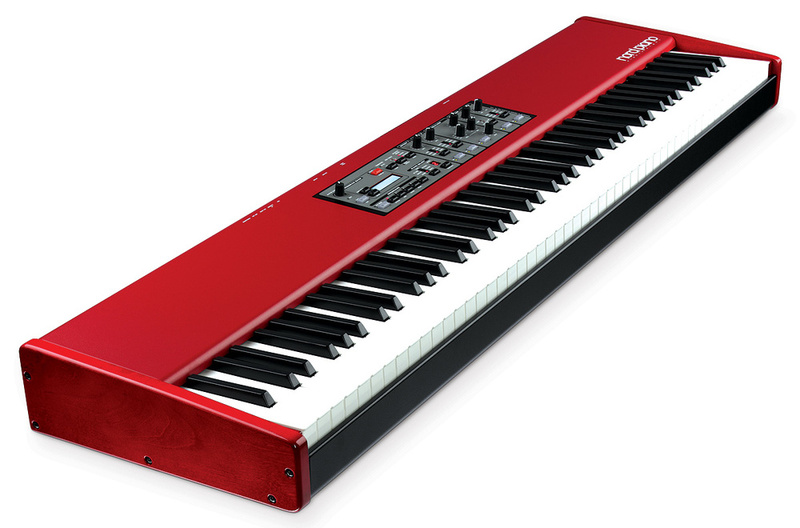 Nord do offer 'medium' versions, though, with resonance samples restricted to the middle of the pitch range. These sound almost as good as the full‑monty pianos but can save 10 or 12 MB. Most good piano sample libraries of recent times have included pedal noises: the 'swoosh' of the damper felts leaving and re-touching the string, and perhaps a bit of mechanical noise too. The NP88 is no different in this respect, but the supplied pedal unit takes the effect to a new level of realism. The damper pedal apparently has no fewer than three separate velocity sensors, so the NP88 varies the amount and type of pedal noise according to how you play the pedal on both the up and down stroke. Thunderous woody booms can be created if you go for it, and this is a big deal — noisy pedalling is actually an important part of styles like boogie‑woogie, just as very subtle and quiet pedalling is crucial for much classical music. There appear to be three pedal‑noise sound sets, one each for the grands, uprights and electrics. While we're on the subject, the NP88's pedal action is progressive — hold it around halfway down and notes are partially damped. As you'd expect, half‑pedalling (incomplete damping of sounding notes when the pedal is quickly released and depressed once more) is recognised and easily controlled. A broad range of excellent piano sounds on board, and the option to replace them with alternatives from the Nord Piano Library v5. A versatile and well‑regulated keyboard action. Confidence‑inspiring build quality and manageable weight. Brilliant sympathetic resonance and damper pedal implementation. More onboard memory would be desirable, though the present provision is by no means miserly. The Nord Piano 88 is a stage piano that's a joy to use and captures the vibe and subtlety of the instruments it seeks to emulate. A future classic.